The Aspire Brand is synonymous with quality and innovation with an outstanding track record of releasing quality Vaping products and accessories from their inception. The new Speeder Kit is no exception! Honing in on their vast experience, Aspire have created an instant classic with the Speeder Mod, paired with the new Athos Sub Ohm Tank. This dual 18650, 200 Watt device is fully functional, with Wattage, Temperature Control, Bypass and Custom Power modes that are easily selected from a user friendly menu format, displayed on a vibrant, auto adjusting OLED Screen. 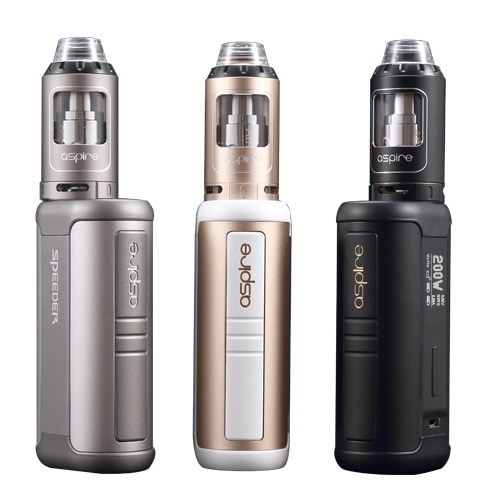 The Device oozes class with its Aesthetics and ergonomically pleasing design, clearly demonstrating the quality we have become accustomed to from all Aspire products. Combined with the Speeder device is the new Athos Sub Ohm Tank which compliments the Mod perfectly. Building on the success of the awesome Cleito range, the Athos sets a new bench mark in the evolution of Tank design with its effortlessly easy to use Top Fill, Bottom Airflow system. Tri and Penta Coil options are available, that will deliver an unmatched flavorsome vaping experience.